Our cooking grates are designed specifically to fit on our fire pits. Buying a grate to add to your firepit can turn your already enjoyable fire into a flexible grill – you can cook just about anything on these. Our grates are also one of the most popular products we sell, probably because people love fire and food. Put the two together and your friends may never leave. Our cooking grates are made in a rectangular format to allow you to add wood to your pit when cooking without having to lift the entire cooking grate off the pit, so not to risk dumping those steaks. 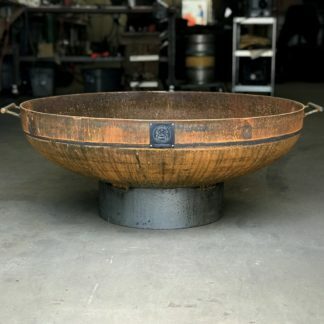 The 30" grate is designed to fit our 30" fire pits and measures 24.5" x 18.5". Please call for a custom grate. Our cooking grates are made in a rectangular format to allow you to add wood to your pit when cooking without having to lift the entire cooking grate off the pit, so not to risk dumping those steaks. 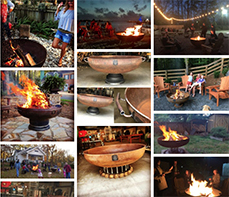 The 36" grate is designed to fit our 36" fire pits and measures approximately 24.5" x 28.5". Please call for a custom grate. Our cooking grates are made in a rectangular format to allow you to add wood to your pit when cooking without having to lift the entire cooking grate off the pit, so not to risk dumping those steaks. 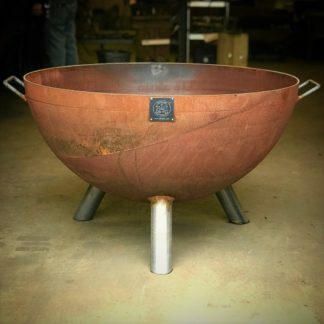 The 37" grate is designed to fit our 37" fire pits and measures approximately 24.5" x 30.5". Please call for a custom grate. Our cooking grates are made in a rectangular format to allow you to add wood to your pit when cooking without having to lift the entire cooking grate off the pit, so not to risk dumping those steaks. 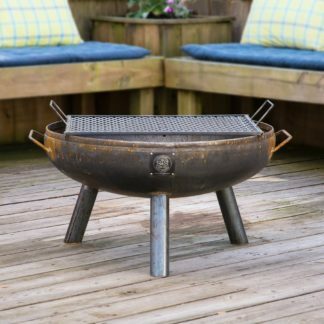 The 42" grate is designed to fit our 42" fire pits and measures approximately 24.5" x 36.5". Please call for a custom grate. The grates we design are all handcrafted, rectangular, edge banded and have handles on either side for easy placement. They also have locking pins, so you won’t accidentally knock your grate and food into the pit. They can be used to cook just about anything. So far, our customers have seared steaks, fish, kabobs, pizzas, ribs, burgers, sausage, Oysters and veggies of all sorts (try the corn over the fire). 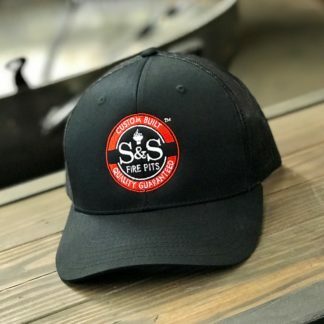 Our customers love cooking food on their fire pits, and their kids love the taste of campfire-cooked foods. Using a grate to cook requires a little patience (and maybe a beer). Start your fire at least an hour early, to get a good bed of coals in the bottom of the pit. The trick to cooking on the fire pit is simple, get your coals where you need them based on what your cooking. So, if you want to cook some nice thick ribeye then you might want a good medium to high heat fire. If you want to cook chicken on the other hand then you’ll need to keep the fire low and slow-burning. A fire that is too hot will cause the outside to burn, while the inside will still be raw. Also, the pits are big enough to have one side at a higher or lower temp than the other. Once you have practiced the process, you can expand your horizons by cooking more complex meals. A favorite American meal that can be cooked on an open flame is pizza. If you’ve ever spent $30 on a wood-fired pizza, you know how amazing an open flame can make a pizza taste. Create a good medium to hot fire under your cooking grate and drop your pizza stone directly on the cooking grate. On a separate table roll out the pizza dough. 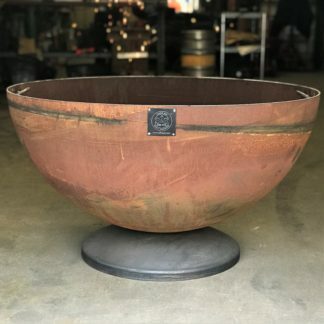 It doesn’t have to be round, any shape will work. Spray the bottom side of the rolled-out dough with oil or Pam, add your sauce, cheese and toppings to the top and place the oiled side down onto your S&S cooking grate and pizza stone. Next drop an old or borrowed charcoal grill lid right on top of the pizza stone creating an oven. Check the pizza bottom frequently. When the bottom and top of your pizza has a nice crispy brown color than you’re done. Remove the pizza, cut and dig in with your friends and family. We like to let everyone make and cook their own pizzas, that way everyone gets what they want and gets involved. Everyone loves sitting around an open fire, there is something about it that relaxes everyone. Being able to watch your food cook in the meantime can make it more fun! Consider adding a cooking grate to your order to become an open flame chef. Your friends, family, even those neighbors who smell what you are cooking will thank you!